Tuesday night's rainfall and temperature decline turned the Wang Mang Ridge into a silver world in north China's Shanxi Province. The Wang Mang Ridge is the highest peak of the southern Taihang Mountain in the Lingchuan County in the city of Jincheng. It's more than 1,700 meters above sea level. 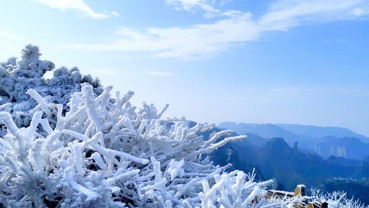 Silver frost was seen all over the mountain peak. Trees, flowers and rocks were all coated by ice, sparkling in the sun.